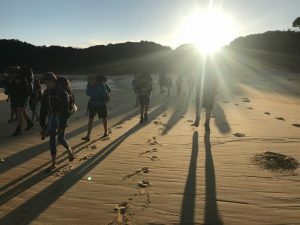 I have experienced Abel Tasman National Park by kayak many years ago and as a day trip in more recent times with the kids but never hiked the trail so was excited to get to experience it with a school trip. Ok I will be honest there was a little trepidation about hiking 60km over 4 nights staying in Department of Conservation huts which are to say the least quite basic, with 12 children aged 11-13 but mostly I was excited. Abel Tasman is New Zealand’s smallest national park located at the top of the South Island. 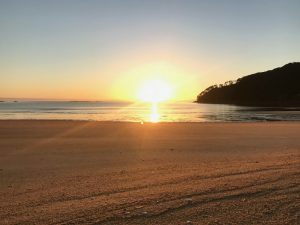 There are actually two tracks; coastal and inland, through the national park which I didn’t know until I looked up Abel Tasman when I was writing this blog so suffice to say the coastal track is the most popular. And that’s not just in my opinion Wikipedia says that too. 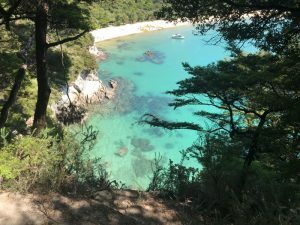 So chances are if you decide to walk/tramp/hike ( depending in where you come from as to how you describe getting along a trail on two feet) in the Abel Tasman National Park you will be on the coastal trail and I promise you wont be disappointed. This trail is so popular that the huts are booked 6 months in advance so planning your route, as always, is a good place to start. Be aware that Awaroa Inlet can only be crossed within 1 hour 30 minutes before and 2 hours after low tide so you may want to plan that in to your bookings. Book your huts on the Department of Conservation website. Our group stayed at Anchorage the first night, then Bark Bay, Awaroa and Whariwharangi. The walks in between these huts were very achievable, in fact as we were up early to catch the low tide crossing from Anchorage to bark bay and shaved 3km off our walk we actually had an afternoon relaxing at Bark Bay . The accommodation on the trail is either in a tent that you have carried in along with everything else you need or a hut with shared sleeping rooms, a toilet and the cooking equipment that you have carried in so yes its quite a lot of gear that you are carrying. So now you have your accommodation booked and you have done your training what’s next? Get out there and enjoy it. Before you go will read about Cleopatra’s pool and the beautiful golden sand beaches but I wasn’t prepared for the complete delight when the day trippers leave and you are one of about 30 people in the bay and then the next morning you get to watch the sun rise over a bay in almost complete solitude. At that point carrying all of your gear on your back to walk in to the wilderness makes perfect sense and I was pleased that it was a 4 day hike so I could experience that delight over and over. 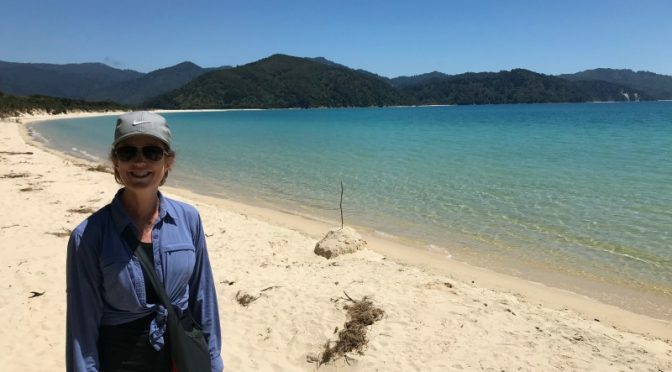 The other thing I love about Abel Tasman is that there are so many different ways to experience it; by kayak which I highly recommend also, by foot, as day trippers in a bay or tramping between bays via water taxi or a combination. I was disappointed that we didn’t get to kayak on this trip as the waters around Abel Tasman are home to seals and dolphins. In fact at one of my lunch time swims I thought I saw seals out on the headland but wasn’t sure as from a distance they do look like rocks, so imagine my surprise when soon after I got out a couple of seals turned up to give us a show. On previous trips to Abel Tasman we have also seen dolphins so if you get the chance do jump in a kayak. The water taxi operators have various options of walking and kayaking and I even meet a group of people who were doing the track in a variety of ways; some walking, some kayaking and carrying the gear in the kayaks and then they would meet up at the hut each night. Because water taxis do service the trail you will find quite a lot of day trippers at some of the beaches and walking the trail so in terms of solitude you definitely wont be the only person on the track. However, the water taxis do make the trail more achievable for people to do parts of the trail or a combination and can even shuttle in food and drop it further along the trail for you. Do talk to them about his before you book as the water taxis only go so far along the trail so again you need to get your logistics sorted. All in all walking/tramping/hiking the Abel Tasman with my daughter’s school outdoor adventure club was one of the best adventures I have ever had and I cant wait to take my family back to experience the delights of truly experiencing the beauty and solitude of Abel Tasman National Park. Just to clarify the low tide crossings, there are several spots where you can do a low or high tide option with the low tide option saving you a few kms but if its high tide you just walk the high tide route. This is NOT the case at Awaroa – there is only one way across and the inlet can only be crossed within 1 hour 30 minutes before and 2 hours after low tide so you want to know the tide before you book. Department of Conservation who manage the trails and huts don’t guarantee the water is drinkable at the huts but it was when we were there. Anchorage has lights in the kitchen/dining area and phone chargers. Two of the other huts we stayed in had lights in the kitchen/dining areas. There are no shops along the way so make sure you take everything with you. There is a café/restaurant at Awaroa but its a steep hill out of there so you might want to consider how much you want that flat white. 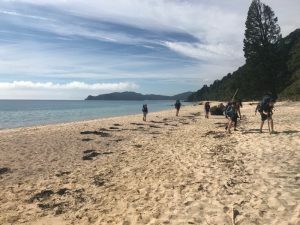 And if you decide a multi-day walk isnt for you then check out our day adventure into Abel Tasman National Park as a family.